Point of Sale Display (POS Display), a simple, yet effective promotional tool. It is easy to set-up, and instantly attracts the attention of a customer just like this POS display by Snickers. 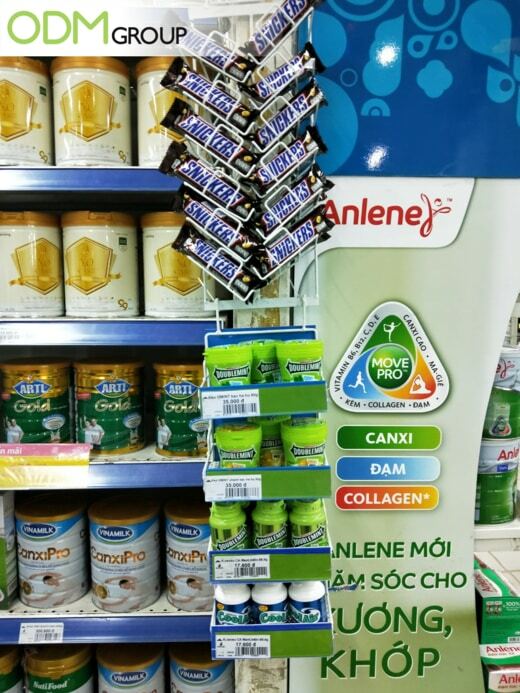 Mars, uses the POS Display for its Snicker’s bars and Wrigley’s chewing gum in the popular Co-Op Mart in Ho Chi Minh City! Easily retrievable items, like those on POS displays, are more likely to be purchased. For this promotion, Snicker bars and Wrigley’s gum are strategically positioned on the POS Display. Why use a Point of Sale Display? Brand Exposure: POS Displays are customizable – helping to increase visibility to customers. A different approach to displays helps the company to be more visible to the customer. Convenience: With a custom POS Display, it is easier for a customer to pick out the products, which would help boost the sales of the brand, thus increasing sales volume. Affordability: The materials used in POS Displays are fairly sturdy and ensures longevity of the display, thereby, generating a great return on an investment while using up little marketing budget. Increased Sales: POS Displays help in driving impulse purchase, particularly if the product stands out. Therefore, as seen from the above analysis, there are many inherent benefits of having POS Displays, and they would certainly help improve visibility and sales. Does this sound like something that your company could do with? If so, we’d love to hear from you! Get in touch with a member of The ODM Group today. Whether design or manufacturing services, our team would love to help you out! Should you need more examples and ideas, please feel free to browse through our blogs. Here’s an example of a similar POS display for chocolates! Here’s a POS display that would certainly be refreshing on a hot day! A marketing idea that would certainly pique your interest! A POS display that would certainly catch the eye!